Barriers in public environments constantly prevent mobility-impaired people from free movement and participation. A narrow doorway here, a step there – that’s all it takes. Wheelmap looks like a very worthwhile project. 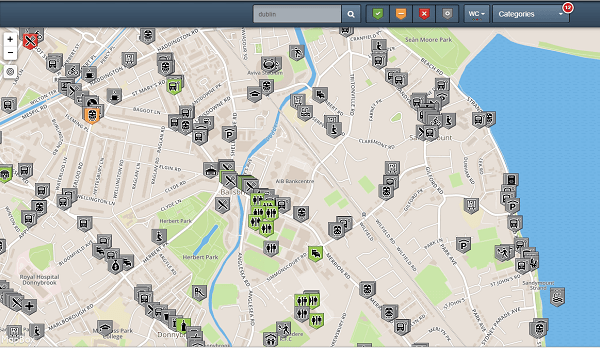 It is an open and free online map for wheelchair-accessible places. It empowers users to share and access information on the wheelchair-accessibility of public places. Anyone can participate by tagging places. Places that are not yet marked have a grey tag and can be quickly and easily marked by everyone. The crowdsourced information is free, easy to understand and can be shared with everyone. Logged in users can upload photos to places or write comments to further describe the wheelchair accessibility of a place! This additional information makes it easy for mobility-impaired users to determine whether they can access the place or not. The Universal Design in Education Conference and ENTELIS Reducing the Digital Divide: the Role of Education Seminar is to take place in Dublin on November 12 and 13. With continued increased technology and a rapidly changing society, digital divide has become an issue that requires addressing. Digital divide is the gap of access and opportunities to new technology between regions and demographics. This is due, in part, to lack of universally designed products as well as services not being accessible to some populations to make best use of technology. This conference looks deeper into the issue of using universal design principles, user empowerment and ICT-AT training to remove barriers. It will provide an introduction to strategies and good practices in reducing barriers to create a more inclusive digital world. Topics of the conference include: empowering lives through technology, design for social innovation, emotional design at core of universal design for learning, and distance education in the context of mobility, digitization and technology.